of Theatre Rhea‘s OREGANO by Rose Napoli. Shaina: How would you describe Oregano? What’s the show about? Diane: There are moments in your life that define you. Often death is one of them. And this play is what grows out of that. For every death there’s a birth – it can be metaphoric. But I think when those moments happen, you not only have to face them, but you learn something about yourself. You learn to accept who you are. The play is about all that, in the format of a fairytale. Rose: In the face of death, one finds their voice. We take that literally in this play, because we talk a lot about the power of the voice. Mimmo is the little boy with a special voice, and Mona is a young woman who wants to be a writer. So it’s very much about the importance of your own voice in connection to the people that shape you. Shaina: What was your inspiration for writing the play, Rose? Rose: The last time I ever saw my dad was 12 years ago. It was his birthday. It was late and it was after an opening of a show. And he stayed up and waited for me and we had a very strange conversation. We were sentimental in a way that we weren’t usually. And in a way, a lot of the things he was saying to me (I didn’t know it at the time), were veiled preparations for me to live without him. I remember we said we loved each other, which we also didn’t do often. I went to bed and I thought: I’m never going to see him again. And he died shortly after that. I think it was because of that moment, even though the realization came later on, that I started to believe in magic. And I started to believe that there are things that are bigger than us. And family is one of them. So, with Oregano I was writing my dad’s life and his death from my imagination. It’s not autobiographical in the sense that it’s not my exact relationship with him and it’s not the exact way he died. But this is the way I imagined it to be. Shaina: Matt, you often work in a site-specific format. How are you finding the experience of creating for the Storefront, which is more of a classic black box? Matt: It’s definitely different and site-specific is something I’m going to have to branch away from any time I’m working in a space where I can’t control all of the factors. So I’ve been getting advice in terms of how other directors work in this situation. We hired a great set designer – Jenna McCutchen – she offered a world and I started using that. I refer back to her designs, the space she’s created, constantly and that offers information much the way a site-specific venue would. I use that for inspiration. Even though we don’t have all the time in the space that I would like, it’s our constraint and it guides the show. We’re using it expressively, much the way I like to do working in site-specific venues. It’s just a different way of working, but the space is still at the forefront of my mind all the time. Rose: We’re also using it in a very different way than I’ve seen this space used before. Matt: That’s something we all decided was very important to us from the get-go. We wanted to see this space used differently than audiences are accustomed to at The Storefront. We wanted to try to change people’s experience when they arrive at this venue. And I think we are on track to do so. I think it’ll be magical. Shaina: Diane and Richard, I know you’ve worked across the country, across the continent, in huge theatres. What continues to attract you to indie productions? Shaina: But they’re pretty awesome. Richard: Really?! And Diane I’ve known forever, but we’ve never worked together. Diane: I have worked a lot of my life in big, huge, honking theatres where a lot of time’s wasted and a lot of egos get in the way. For me it’s returning to my roots. I started with The Free Theatre and Tarragon – they WERE the indie theatres in the 70s and late 60s. The Free Theatre had a dirt floor – it was FREE when I played there. So for me, it isn’t about the money, it’s about getting back to basics, it’s about working with people that I have respect for, that I want to work with, that I haven’t had the chance to yet. It’s about the challenge. And this is more challenging than some of the other stuff I get often in the big box theatres. Shaina: What has been the biggest challenge? Matt: The collaboration has been lovely. We have actors who have worked all across our country in these big theatres and I love that they’re coming back to work with us in indie theatre. It’s really refreshing and it’s really invigorating. So that hasn’t been a challenge. With independent projects, it’s always scheduling. That’s always a challenge because everyone’s always doing so much. But for some reason, when you set that as the challenge that needs to be faced from the get-go, it just makes it easier. You embrace it and you approach that creatively with a good spirit and everyone has to invest fully when they’re here. That’s absolutely been the case. Shaina: Beau, what attracted you to the project? What’s the experience been like for you adapting this story to music? Beau: To echo what Richard said, it’s first and foremost about the story. The most difficult thing, but it’s also the most enjoyable and challenging, is using sounds to make sure that the audience is in the world of the fairytale. I really have to marry the sounds with the text. That’s one of the magical things about theatre: using sounds, the different frequencies, the pushing of air (as I like to call it), to create a world. When you have accomplished actors, and a story that really speaks for itself, you don’t want the music to get in the way. So there’s a real push and pull that’s happening between the sound and the text. And once you get that tension and release with the sound, and once the audience is engaged and thrown into that world, it IS magical. But the real struggle is making it believable – making the audience feel that they too are using their creative brains and are immersed in that world without feeling forced into it. Shaina: What was the initial inspiration to make the play so musical? Rose: In the play, Mona, the main character, has the chance to meet her father as a young boy – a young boy who Richard plays. He plays himself from 8 years old all the way to his 50s – his whole life really. This boy has a very special ability with his voice. When he sings, he can relax the people who listen to his music so deeply, that they reveal their deepest fears. There was always meant to be a component that brought us back in time – there are many memories in the play. The music is the thing that brings us to the different time periods in the play. And then that concept went to the next level having Beau on board, a composer who is so versed in MADE scores. You can see his set up down there – he is making music with the strangest things! So why not take it a step further, to embrace the magic of this play and have the sounds (the rain, the thunder, all of the soundscape in the show) happen live rather than through a soundboard. Richard: Doing that also enhances the magic of the theatre itself. And the reason theatre is magic is because it IS imagination. And what the play is about, in a lot of ways, is the imagination, and how you can create your life as you imagine it, to a certain degree. You can certainly deal with things in your life through the way you imagine them. 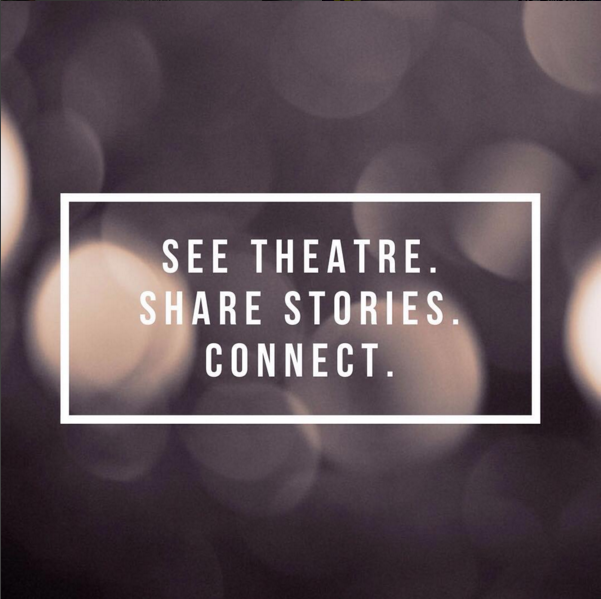 If you want to make magic in the theatre, you do it by showing what’s up the sleeve. You don’t try to hide it, because we can’t do it that well in the theatre. You can do that on film, you have CGI, but we don’t. So you can make magic by saying: “imagine this is the planet earth in my hand,” and then you smash it. And everyone goes along with it because the theatre is essentially naïve. To see Beau create a storm sequence by using a tarp and a weird can with a string attached to it, is far more magical than the most realistic sound you can tape and play back over a sound system. There isn’t enough money in theatre to achieve what the imagination can. Shaina: If you could have anyone in the audience to see this show, who would it be?